Stop! Before you use a commercial product that may damage your carpet or upholstery, call the experts at (502) 935-2205. Many stain and odor removal products are not designed to remove certain types of stains from certain types of fibers. Kentuckiana Carpet and Upholstery Cleaning LLC has specialized in odor removal from area homes and businesses since 2000. There is a science to proper odor removal. Some companies camouflage the odor, only to have it return in a couple days. Call the company that will neutralize and remove it! 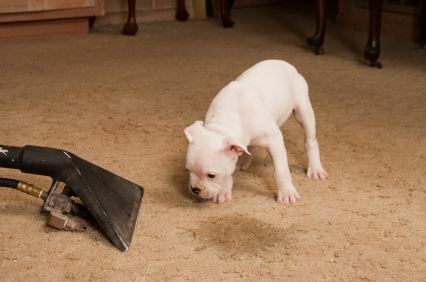 Besides the horrible smell, pet urine and vomit can cause permanent damage to your carpet and upholstery fabrics. Removal of stains and odors, whether from pets, kids, or a crazy weekend, is a science, and Kentuckiana Carpet and Upholstery Cleaning LLC technicians are highly skilled in odor and urine removal. The pH of "fresh" urine is between 5 and 6, which is on the acidic side. Once dried, urine becomes more alkaline, with a pH of 10 to 12. Fresh urine is easiest to clean. Prompt clean up is ideal, as warm, acidic urine breeds bacteria. As the urine dries, the ammonia can cause a permanent stain in your carpet or upholstery. The odor and urine removal experts at Kentuckiana Carpet and Upholstery Cleaning LLC will tell you that water can actually WORSEN the odor associated with urine. This is why pet owners experience stronger odors on humid days. Kentuckiana Carpet and Upholstery Cleaning LLC technicians will REMOVE pet urine stains and NEUTRALIZE the odors by utilizing specialized enzymes that consume the odor causing bacteria, and removing all of the alkaline salt deposits that dried urine leaves. Call Kentuckiana Carpet and Upholstery Cleaning LLC today and be free of that SMELL!